Fitting and grooming are important parts of the show process for cows. A cow that is not well clipped and groomed has no more chance of winning a fair then one that is poorly trained or has poor body composition. Fitting is the process of brushing a cow's hair so that it stands up. Grooming cleans the animal so that their color and coat characteristics are readily visible. You should groom and fit your animals regularly during the show season and with special care immediately before fairs. Wash the cow thoroughly. This will both clear waste and dirt from the animals coat and stimulate hair growth. Wet the cow's hair thoroughly by dumping water over it or spraying it with a water hose. Lather it with a horse hair or cattle shampoo. Pay special attention to the legs, belly and white areas of the coat. Scrub the cow with a rubber curry comb. You will need to scrub deeply so that skin flakes are pulled away, or the cow's coat may be flaky like it has dandruff when you are done. Rinse the soap, grime and loose hair from the animal completely. Blow dry the cow completely. Dry the animal from the front to the back, and from the top to the bottom. Keep the blow dryer level and at a 45-degree angle so that all the hair is blown down flat and in the same direction. Make sure that you dry the head, legs and tail – not just the cow's main body. Comb the cow’s hair. The hair should be combed upward at about a 30-degree angle. This will promote hair growth. Use a rice root brush to comb the cow down at least once a day during show season. Scotch comb the cow during the actual show. The scotch comb is used to comb hair that is messed up while in the arena either by the judges' handling or when a person or another animal bumps into the cow in the ring. Clip the animal so that you enhance its strongest physical features and minimize its weak points. Clip the animal seven to 10 days before the fair so the ends of the hair will soften some and look more natural on the day of the fair. Clip the head from the poll forward with a small set of clippers, sometimes called beef head clippers. The poll is the large knot on top of the head. Then clip from the face of the cow down toward the brisket. When well-blended, this will make the neck look elongated. Clip the cow’s body using a large set of clippers, like sheep sheers. Use both hands while trimming the body: use the hand you write with to control the clippers and place the other hand under the clippers to keep them steady. Clip the cow so that its top line looks flat and its shoulders and hindquarters look square. The hips should look fully level. Trim the legs so they also look flat and square or rectangular. Blend the cut so there are no visible lines between hair lengths. Pull up the hair on the legs using the scotch comb. The hair should be pulled so that it goes up and forward along the leg. Use a spray adhesive to hold the combed hair in place. This is like a strong hairspray and should be applied carefully so that it does not glob or run. You want the final look of the hair to be as natural as possible. Pull the hair on the hand quarters and tail head with a scotch comb and spray it with an adhesive in the same way that you did the legs. Scotch comb the hair on the body upward and forward then spray the hair with an oil based conditioner to give it a sheen. Pull the hair on the hind quarters and tail head with a scotch comb and spray it with an adhesive in the same way that you did the legs. Scotch comb the hair on the body upward and forward; then spray the hair with an oil-based conditioner to give it a sheen. Clip a young or nervous cow from back to front, rather than front to back. This will allow them to get used to the sound and feel of the clippers before you try to clip their head. Only clip the animal when its coat is both clean and dry. 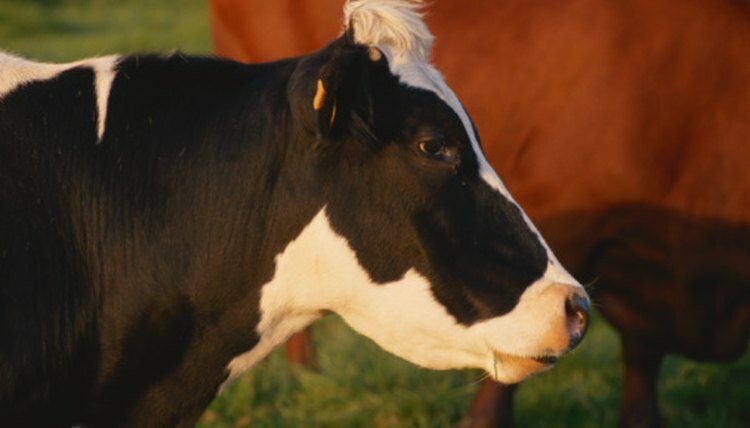 What Do Judges Look at When Looking at a Cow?